1986, 80s Career, Retro Beginners Clothing Patterns - MISSES' DRESS AND BELT: Pullover dress, with self-fabric or contrast collar, has buttoned bodice, shoulder pads, patch pocket, elastic in waistline seam casing and straight skirt with side seam pockets; short sleeves have gathered caps with sleeve heads. Self-fabric covered belt and buckle or purchased belt. 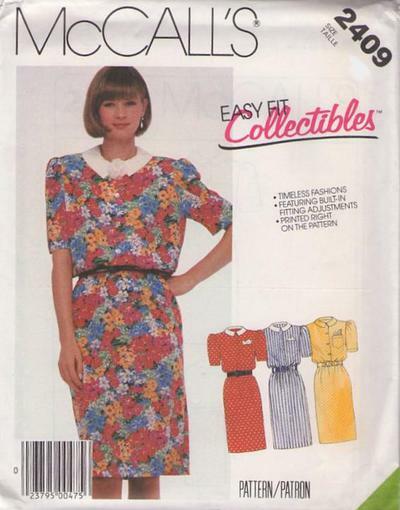 NOTE: This pattern features bust adjustments.